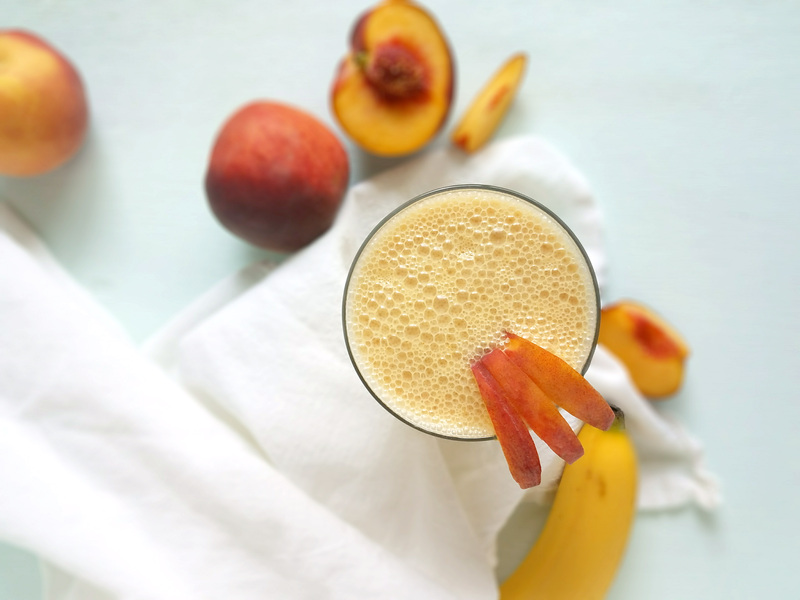 Thanks to kefir, turmeric and ginger, this Anti-Inflammatory Peach Kefir Smoothie is loaded with probiotics as well as antioxidants, protein and lots of nutrients! It’s a gluten-free, nut-free and delicious way to start your morning. One of the reasons I like smoothies is because I can “hide” superfoods and other highly nutritious ingredients in them. Typically that’s leafy greens, but this time it’s turmeric, a spice that has been used in cuisines around the world for thousands of years. Turmeric doesn’t just add a yellow color to curry, though. It also boasts more health benefits than almost any other spice. And it’s hidden in this smoothie! This Peach Smoothie has even more hidden in it than turmeric, though. It’s also hiding ginger and kefir. All together, this smoothie is nutrient dense and rich in probiotics, antioxidants and inflammation-fighting ingredients. The macronutrients in this smoothie are well balanced and it’s free of gluten and nuts yet still provides a long list of health benefits. Read on to learn what those are! Ginger not only soothes and calms the digestive system by fighting nausea and gas, it also fights inflammation by inhibiting the production of pro-inflammatory compounds (source). Black tea is rich in antioxidants, namely polyphenols and catechins, that may do everything from decrease cancer risk to lowering the risk of heart disease (source). Kefir has traditionally been made by fermenting milk. This makes kefir rich in calcium, phosphorus, vitamin B12 and B2 and probiotics, which by themselves offer us a long list of health benefits such as improved digestion and nutrient absorption, bowel regularity, and immune function (source). 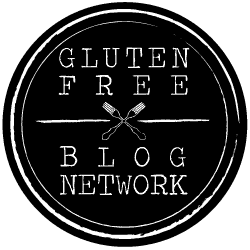 See my Tzatziki Inspired Cucumber Salad post for more information. Bananas as I noted in my Flourless Banana Nut Muffins and Chocolate Peanut Butter Banana Smoothie post, bananas provide vitamin B6 and vitamin C as well as potassium, manganese, antioxidants and fiber. As a result, bananas are good for heart health and digestion (source), and may even help the body produce neurotransmitters (source). 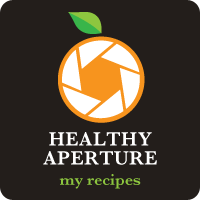 Peaches are also a good source of vitamin C as well as vitamin A and fiber (source). This smoothie tastes great, yet it is so good for you! With protein, minimal sweetener, a wide range of nutrients, probiotics and powerful compounds that fight inflammation, this smoothie is sure to make you feel great! 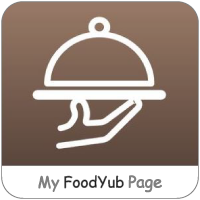 See how to make it in the video below and then keep reading for more information and the recipe. 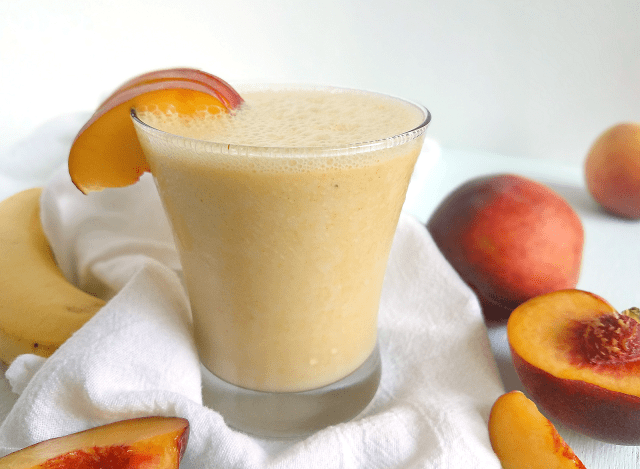 A lot of the best nutrients in this Peach Smoothie are fat soluble, which means that they are absorbed multiple times better when consumed with fat (source). That means you don’t need to reach for low-fat or fat-free kefir, you can indulge in the creamy, full fat version! 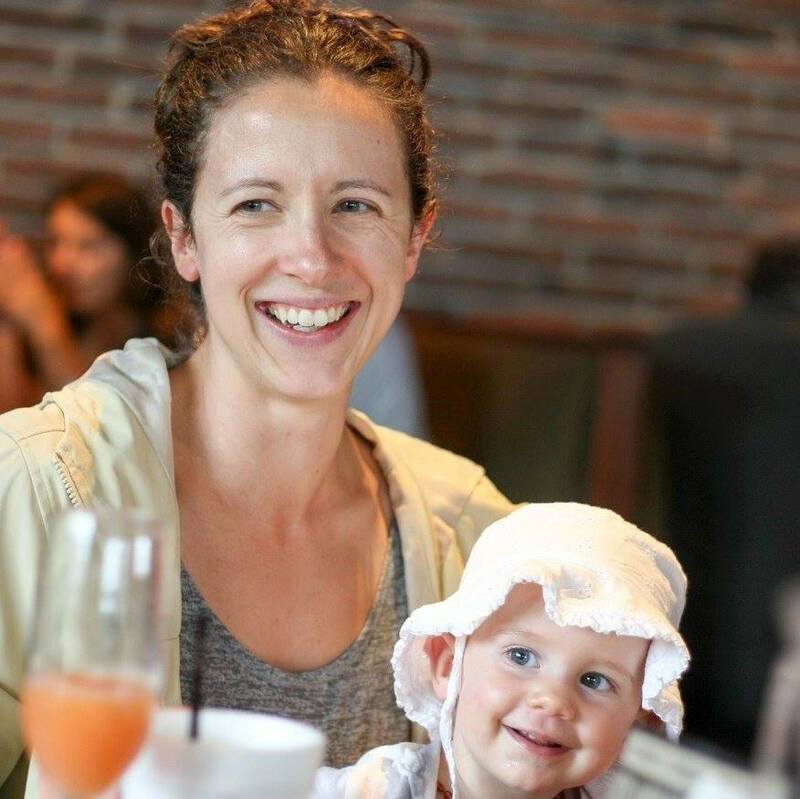 Just be sure to choose kefir from organic and grass-fed cows for the cleanest and most nutrient dense kefir. My favorite brand is Maple Hill, but Lifeway is so widely available that I’ve seen it at Walmart! 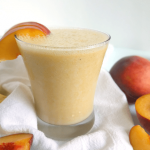 Make this recipe as easy as possible by using frozen organic peaches and bottled, unsweetened iced tea. More concerned about maximizing nutrients? Great! Choose fresh, organic peaches grown locally and brew your own black tea. Just be sure to let the tea cool and add ice to make the smoothie thick and cold. I use my Ninja Master Prep to make this smoothie. It’s affordable and does a great job! My Ninja Master Prep has been used heavily for almost five years now and it’s still going strong! 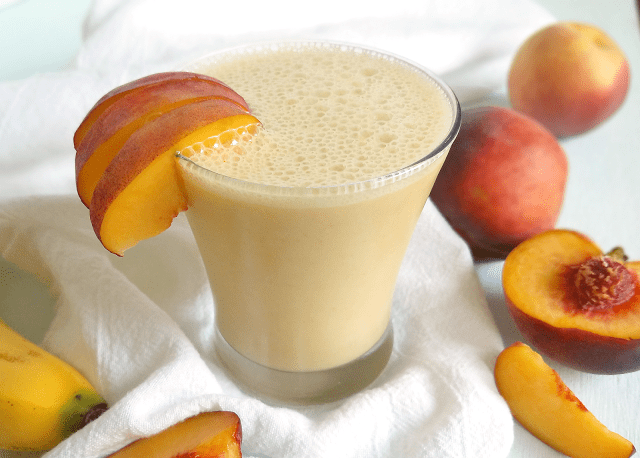 Thanks to kefir, turmeric and ginger, this Anti-Inflammatory Peach Kefir Smoothie is loaded with probiotics as well as antioxidants, protein and lots of nutrients! It's a gluten-free, nut-free and delicious way to start your morning. Add ingredients to a blender in the order listed above and blend until smooth. If fresh peaches are being used instead of frozen peaches, add ice as needed for the desired frozen consistency, about 1 cup.